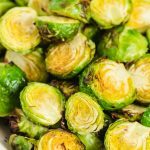 These Air Fryer Roasted Brussels Sprouts are tender and crispy. Top with your favorite sauce, or enjoy them with our seasoning recipe! Wash the Brussels sprouts and remove the outer leaves if they're loose and then slice in half. Toss the brussels sprouts in avocado oil and seasonings. Roast them in your air fryer at 400 degrees F for 8 minutes. Give a shake or flip them and then roast another 6-8 minutes or until desired doneness.